Errol: There is a discussion on the forum I remember reading about how NaNoWriMo is a fandom now. Pretty crazy, but awesome at the same time! And yes, there is a musical. Although, all of you know that by now. Oh, and while were on to fandoms, a close friend of mine does some HP Lovecraft videos. Yup. He dons the persona of HP Lovecraft, (an author), and answers questions that the internet poses to him. And he did one about NaNoWriMo! 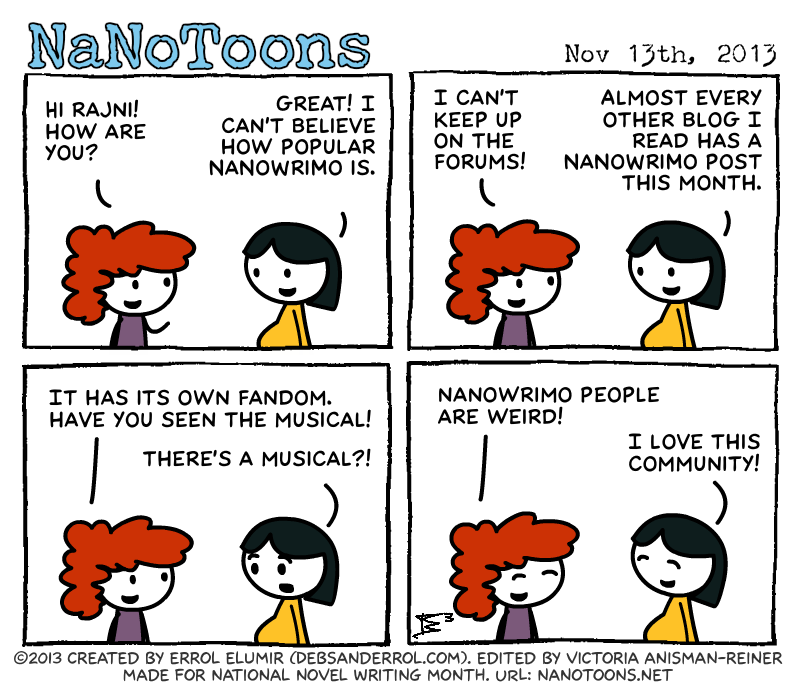 Seriously, I’m obsessed about NaNo every November. My poor family. This entry was posted in 2013 and tagged rajni, victoria. Bookmark the permalink. I am an experienced fangirl. I think I’m an even bigger NaNo fangirl than I am for A:TLA. I think I’m an even bigger NaNo fangirl than I am for *HP*. I look around at my fellow Wrimos every write-in and think ‘These are my people’. And then I shout at them to keep writing, sprint over in 5 minutes.